You could easily argue that Albert Einstein was the world’s most brilliant theorist. Yet at a critical juncture of his life, he used his human reasoning instead of God’s Word and it turned out to be quite the embarrassment! In 1917, Einstein was completing his famous theory of relativity, E = mc2. But he had a problem. His theory suggested that the universe must be expanding outward and decelerating in order for all the math to work out. He realized that his theory would lead to the conclusion that the universe had to have had a beginning. This was a problem because most astronomers at that time believed the whole universe consisted of just one galaxy, what we have dubbed the Milky Way. Beyond that was just deep space. Since the Milky Way as a whole didn’t seem to be moving together or apart, Einstein could not believe his own calculations that the universe had a beginning, which was contrary to known science of the day. So Einstein made a “mathematical adjustment” to his equation, a “cosmological term” (dubbed “Einstein’s Fudge”) denoted by the Greek letter lambda, that added stability to the universe. Basically he added an arbitrary force to counteract the force of expansion. He justified this by explaining that the universe was never-ending but was curved and bent around to meet itself. It wasn’t long before the “fudge” was exposed and decried as “funny energy.” Ernest Mach, from whom the supersonic term Mach is derived, first poked fun of Einstein using the law of inertia. Then Karl Schwarzschild, a German astrophysicist, sent Einstein written calculations proving he was wrong. Albert Einstein, Walther Mayer and William W. Campbell at the Mt. Wilson Observatory (1931). But the final straw came 10 years later—not in calculations but through observation. Ed Hubble, who had quit practicing law in order to embark in the field of his newfound love—astronomy—invited Einstein out to the Mt. 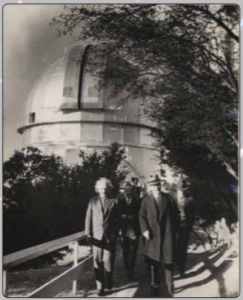 Wilson Observatory near Pasadena, California, where he worked. The observatory housed the world’s largest dome telescope at the time. 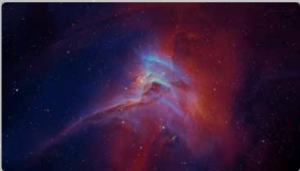 But more importantly, observing what is called the “Red Shift,” Hubble proved to Einstein that the universe was moving apart and decelerating. Einstein could no longer believe the universe was static, but rather, it had to have had a beginning. 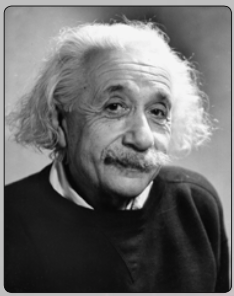 Einstein’s famous quote when confronted by the media was, “I now see the necessity of a beginning.” He later referred to his fudging his own scientific results as the greatest mistake of his scientific career. Einstein was Jewish, but not religious. He said he was not an atheist, but rather an agnostic. He is quoted as saying, “The idea of a personal God is an anthropological concept which I cannot take seriously.” Had he believed in a personal God, and God’s inherent Word, the first sentence would have solved his dilemma. Today we see scientists doing the same thing Einstein did 100 years ago. They are allowing their bias against any thought of a Creator God to cloud their reasoning. This is why we constantly have Steeling the Mind Bible Conference speakers lecturing on the scientific evidences that are patently being ignored by most scientists today. Compass has recorded and has available over 50 outstanding apologetic presentations that slay the theory of evolution using scientific facts. If you want to sample one of these presentations for free, or give a non-believer a free download, here’s how: Go to www.compass.org/videos/ Put a video in your cart and check out using the coupon code TRUTH and the download will be free.